The cornea possesses the most dense sensory innervation of the body. It has been estimated that the cornea contains 300–600 times more sensory endings than the skin and 20–40 times more than tooth pulp. Source: Belmonte, Carlos; Gallar Juana (1996). "6: Corneal Nociceptors". Neurobiology of Nociceptors. Oxford University Press. During LASIK surgery, nerves in the anterior cornea are severed during creation of the flap, and deeper corneal nerves are destroyed by laser ablation. Medical studies demonstrate that corneal nerves do not recover normal densities and patterns after LASIK. Some patients report severe, persistent eye pain after LASIK. Eye pain after LASIK is frequently diagnosed as dry eye, but there may be more to it than just dry eyes in some cases. 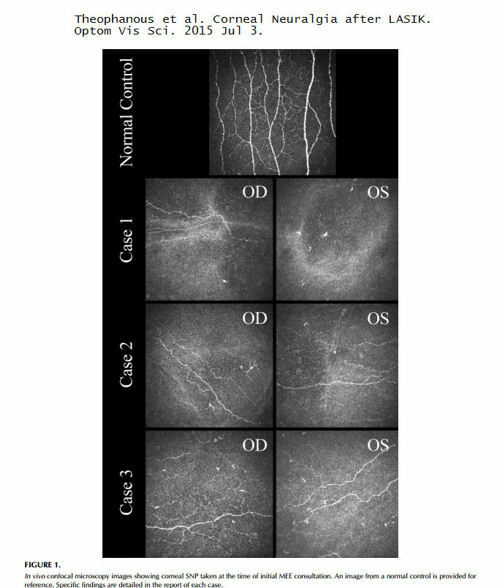 Confocal microscopy examinations of post-LASIK eyes reveal aberrantly regenerated nerve fibers in the cornea, which may lead to corneal neuralgia (pain). For some patients, eye pain after LASIK is incapacitating and leads to thoughts of suicide. Patients who experience persistent eye pain or other complications after LASIK which negatively affect quality of life should file a MedWatch report with the FDA online. Alternatively, you may call FDA at 1-800-FDA-1088 to report by telephone, download the paper form and either fax it to 1-800-FDA-0178 or mail it to the address shown at the bottom of page 3, or download the MedWatcher Mobile App for reporting LASIK problems to the FDA using a smart phone or tablet. Read a sample of LASIK injury reports currently on file with the FDA. From the article: "Dr. Pedram Hamrah treats patients from all over the world at his clinic at Tufts Medical Center in Boston. He believes some cases of "dry eye" are, in fact, a condition called corneal neuralgia -- severe pain caused by damaged nerves in the cornea.The condition is often missed because standard diagnostic tools are not designed to uncover the problem. As a result, patients with “corneal neuralgia “ have corneas that can appear normal, he explained. When Dr. Hamrah’s team uses a high-powered in vivo confocal microscope to capture high resolution images of a cornea, the damage is clear. Often the nerve endings of laser eye patients appear amputated or resemble a tangled ball of yarn, he says. These abnormal nerves become hypersensitive, which manifests in pain, dryness and sensitivity to light.ated or resemble a tangled ball of yarn, he says. These abnormal nerves become hypersensitive, which manifests in pain, dryness and sensitivity to light." From the article: "But a W5 investigation uncovered a small but increasingly vocal group of patients who claim they developed a very rare complication after surgery that left them in chronic pain, unable to work and even contemplating suicide." "Ophthalmologist and cornea specialist Dr. Pedram Hamrah sees patients at his clinic at Tufts Medical Center in Boston from all over the world—many are suicidal and desperate for answers. They have eye pain caused by injury, illness and surgery. Some develop it after cataract surgery. About 20 per cent of his patients are post-Lasik.Dr. Hamrah says in some cases, what’s dismissed as dry eye, is in fact a condition called corneal neuralgia—severe pain caused by damaged nerves in the cornea." By Darrell E. White, MD. Excerpt: "It is my strongly held position that these patients do not suffer from regular, garden-variety dry eye disease... These individuals have neurogenic pain, the so-called “phantom dry eye.” This is nerve pain caused by some sort of inappropriate peripheral nerve signaling that results in aberrant central pain processing. Chronic pain of any type is a well-known cause of depression and can lead to death by suicide. These are chronic pain patients and should be treated as such." Jay Prepose, MD: "I think that we've become much more aware now of this new syndrome, [corneal] neuropathic pain. It may involve about 19% of patients following cataract surgery, very similar to what we've heard with other types of surgery such as LASIK with new onset pain." Medeiros et al. The Impact of Photorefractive Keratectomy and Mitomycin C on Corneal Nerves and Their Regeneration. J Refract Surg. 2018 Dec 1;34(12):790-798. "Morphology of regenerating nerves after PRK was abnormal with more tortuosity and aberrant innervation compared to the preoperative controls even at 6 months after surgery." August, 2013: Dr. Rosenthal reported that his website had been hacked. Read Information Suppressed. Ocular neuropathic pain - New dry eye theory and an invisible and previously overlooked agonizing chronic eye pain syndrome that Dr. Rosenthal identifies as oculofacial pain. UPDATE MARCH 3, 2018: Dr. Perry Rosenthal has passed away at the age of 84. He will be sorely missed. Dr. Rosenthal taught us what it means to be a doctor. Rest in peace, Doctor Rosenthal. Mcmonnies CW. The potential role of neuropathic mechanisms in dry eye syndromes. J Optom. 2016 Jul 15. Excerpt: The most common complaint by patients who undergo refractive surgery is ocular dryness, which is reported by more than 40% of them, particularly on waking. Reduced sensory input as a consequence of transected corneal nerves may help explain dry eye symptoms occurring after refractive surgery. However, while it was initially believed that post-laser assisted in situ keratomileusis symptoms were caused by ocular dryness, and referred to as “dry eye” it is now increasingly understood that corneal nerve damage produced by this surgery resembles the pathologic neuroplasticity associated with other forms of persistent post-operative pain. In susceptible patients these neuropathological changes, including peripheral and central sensitisation, may underlie certain persistent dry eye symptoms following refractive surgery. Excerpt: "The American Eye Institute estimates that dry eye affects about 3 million Americans every year. When the eyes do not produce an adequate supply of tears or the tears evaporate too quickly from the surface of the cornea, patients develop an “itchy” or painful sensation. Left untreated, dry eye can lead to inflammation, ulcers or scars on the cornea. “Patients’ eyes may become hyper-sensitive to stimuli, such as wind or light, or have spontaneous pain such as a feeling of burning, which is typically associated with nerve injury,” said Levitt. PURPOSE: The most likely etiology of post-LASIK dry eye is corneal nerve damage; however, no direct relationship between post-LASIK dry eye symptoms and nerve damage has been established, and limited information is available about the relationship between dry eye signs and corneal reinnervation after LASIK. Tear neuropeptides (SP and CGRP) are important in the maintenance of corneal nerve health, but the impact of LASIK has not yet been studied. This study evaluated changes in nerve morphology, tear neuropeptide, and dry eye, so as to establish the relationship between reinnervation and dry eye and to assess the role of tear neuropeptides in reinnervation post-LASIK. METHODS: Twenty non-dry eye volunteers who had undergone bilateral myopic-LASIK completed this study. Corneal nerve morphology (density, width, interconnections, and tortuosity), SP and CGRP concentration, and dry eye were monitored over time prior to, 1 day, 1 week, 1, 3, and 6 months post-LASIK. RESULTS: Dry eye symptoms and tear function, except for osmolarity (P = 0.003), remained unchanged post-LASIK. Corneal nerve morphology decreased immediately, and did not return to preoperative levels by 6 months post-LASIK (P < 0.001). Increased tear SP concentration was observed 3 months post-LASIK (P < 0.001). Associations between reinnervation as measured by increased density and lower tear SP (P = 0.03), and between increased density and decreased dry eye symptoms (P = 0.01) were found post-LASIK. CONCLUSION: An inverse relationship between reinnervation post-LASIK and dry eye symptoms was found, confirming that post-LASIK dry eye is a neuropathic disease. This study is the first to demonstrate an association between tear SP and post-LASIK reinnervation, suggesting that strategies for manipulating neuropeptide concentration to improve reinnervation may improve ocular comfort post-LASIK. From the full text: "Symptoms of post-LASIK dry eye are most likely due to nerve damage caused by the surgical procedure." Source: Theophanous et al. Corneal Neuralgia after LASIK. Optom Vis Sci. 2015 Jul 3. From the full text of the article, the image below shows corneal nerves of a normal, unoperated cornea (top) and corneal nerves of both eyes of 3 LASIK patients. You can clearly see that corneal nerves in post-LASIK eyes are severely reduced and abnormal. Laser in-situ keratomileusis (LASIK) is a commonly performed surgical procedure used to correct refractive error. LASIK surgery involves cutting a corneal flap and ablating the stroma underneath, with known damage to corneal nerves. Despite this, the epidemiology of persistent pain and other long-term outcomes after LASIK surgery are not well understood. Available data suggest that approximately 20-55% of patients report persistent eye symptoms (generally regarded as at least 6 months post-operation) after LASIK surgery. While it was initially believed that these symptoms were caused by ocular surface dryness, and referred to as "dry eye," it is now increasingly understood that corneal nerve damage produced by LASIK surgery resembles the pathologic neuroplasticity associated with other forms of persistent post-operative pain. In susceptible patients, these neuropathological changes, including peripheral sensitization, central sensitization, and altered descending modulation, may underlie certain persistent dry eye symptoms after LASIK surgery. This review will focus on the known epidemiology of symptoms after LASIK and discuss mechanisms of persistent post-op pain due to nerve injury that may be relevant to these patients. Potential preventative and treatment options based on approaches used for other forms of persistent post-op pain and their application to LASIK patients are also discussed. Finally, the concept of genetic susceptibility to post-LASIK ocular surface pain is presented. The table below shows reported incidence of chronic dry eye symptoms after refractive surgery (LASIK and PRK). Nettune GR, Pflugfelder SC. Post-LASIK tear dysfunction and dysesthesia. Ocul Surf. 2010 Jul;8(3):135-45. Through a variety of mechanisms, LASIK induces transient ocular surface changes that may lead to permanent ocular surface dysfunction in some patients. From the article: “ 'Doctors should have an awareness of [keratoneuralgia],' he said. 'Unfortunately, it’s turned out to be a rare but serious side effect of LASIK.' The issue is a particular problem because it can affect productive people whose quality of life is being diminished. The pain can sometimes be so intense that people may want to commit suicide. Usually their vision is fine, but they have eye pain they are unable to deal with." "However, in the rare patient with chronic pain, resolving the dry eye doesn’t help, and Dr. Wilson says that’s when you need to get a pain expert involved, in anticipation of starting more serious medications." From the article: "Patients go to their ophthalmologists, some of them suicidal because of the pain, and their eyes on the slit lamp look perfectly normal," said Perry Rosenthal, M.D., founder, Boston Foundation for Sight... No one knows exactly what causes this neuropathic pain to develop after photorefractive keratectomy (PRK) and LASIK, but there are some theories. First, it's important to note that the cornea is the most powerful pain generator in the human body, 200 times more powerful than skin. "The most common cause of neuropathic pain anywhere in the body is damage to the sensory nerves," Dr. Rosenthal said. "Obviously, LASIK and PRK are classic examples of this. It's what happens next after the damage that determines if the post-op pain resolves as the corneal tissue heals or whether it triggers the development of that chronic disease called neuropathic pain." From the article: Corneal neuralgia is a newly described disease process refractive surgeons wish was mythological. Lt. Cmdr. John B. Cason, M.D., cornea, external disease, and refractive surgery, Naval Medical Center, San Diego, gave an overview of the symptoms, which many patients find excruciating. "The hallmark of this is how uncomfortable these patients are," he said. "But when you examine them, you don't see anything causing it. These patients are extremely difficult to treat; they keep coming back to your clinic. All the therapies you give them fail, and because of this, many of us think they're making it up." The pain these patients are feeling, however, is very real. Some patients are so uncomfortable and so despondent over failed treatments that they become suicidal. As one patient Dr. Cason had in fellowship said, "I want my eyes taken out or I want to die." Lasik inventor: "I knew corneal incisions would cut the corneal nerves..."
Amelia Tope. Corneal nerve regeneration: how can we accelerate the process? Ophthalmology Times. September 01, 2007. "When I invented LASIK in 1985, I knew that corneal incisions would cut the corneal nerves but felt that the benefits, would outweigh the possible disadvantages," explained Professor Peyman. "However I did not foresee that it would cause dry eye in up to 70% of patients." A recent study to assess the subjective symptoms and objective clinical signs of dry eye, in addition to corneal sensitivity after high myopic LASIK, found that the majority of the 20 patients reported ongoing dry eye symptoms. The researchers noted, however, that the objective clinical signs of tear insufficiency and hypoesthesia were not demonstrable and proposed that the symptoms, therefore, represented a form of corneal neuropathy rather than dry eye syndrome. I had LASIK eye surgery in [redacted] 2009. Two weeks later I started to suffer with severe headaches and severe eye pain, in addition I had sudden vision regression. I have been seeing a neuro-ophthalmologist at the [redacted] for my condition. I have been diagnosed with a rare form of corneal neuropathy pain from LASIK. I had LASIK with IntraLase technology in 2006. For the first two years after LASIK, I experienced intense, unremitting eye pain and dry eyes. My LASIK surgeon focused solely on treating the dry eye condition with the expectation that the extreme eye pain I was experiencing would resolve as my dry eye condition improved. At one year post-LASIK, my dry eyes had moderately improved but the intense, unremitting eye pain intensified to a level that was nearly unimaginable. I started seeing a neurologist when it was determined that I had post-LASIK induced neuropathy. I tried many different neurological pain medications including Garbentin and Lyrica in addition to Restasis and lubricating drops for dry eyes; however, the pain was intractable. At about 2.5 years post-LASIK my neurologist prescribed Verapamil, which helped more than any other medication. I'm also taking Carbamezipine (i.e. Tegretol). I'm currently on 240 mg. of Verapamil and 800 mg. of Tegretol. I still get eye pain, but the pain level is much less than it used to be and I can go days, if not weeks at times, without pain. When I do get pain, it's usually only for a day or two. Even then, I've recently found a medication that helps. It's called Butal-Acetamin-CAF 50-325-40. I use this like most people use Ibuprofen. On the occasional days when I have eye/head pain, I take one tablet for a day or two and it helps. I should note a few additional things that I still do on a daily basis. I take 3 fish oil softgels a day for my dry eyes (TheraTears Nutrition 1200 mg Omega-3 supplement) and I have a 5-minute warm compress routine followed by a TheraTears SteriLid eyelid cleanser scrub using a Q-tip to gently go across my upper and lower eyelids. I let the eyelid cleanser sit on my lids for at least 60 seconds and then I rinse my eyes well. This routine is primarily to treat my dry eyes because, while the dry eye has improved from my early post-LASIK days, it still can negatively affect my quality of life if I don't stick with the routine. I also tried different holistic remedies during the first 2 years post-LASIK including approximately 40 acupuncture sessions and 30 cranial sacral therapy sessions. I think both helped to a degree but neither allowed me to fully regain my quality of life. While I'm not certain that each medication I take will work the same for another post-LASIK patient with chronic eye pain, I am certain that there's lots of different medications to treat neurological pain and you need to work with a good neurologist who’s caring enough to work with you through the trial process. I know the process can be long and painful, but please understand that there is a light at the end of the tunnel and you can get there. The cornea is the most highly innervated tissue on the surface of the human body. When the cornea is damaged, the corneal nerves can emit an incredible amount of intense physical pain. There is a good reason why most eye doctors wear glasses and do not get LASIK. Due to greed, the eye care community does not feel a sense of obligation to insist that a harmful procedure like LASIK not be done on the general public. Remember, the health and well-being of your eyes are at stake and you only get two eyes in this lifetime. I should note that I have 20/20 vision from LASIK, but I wish that I could turn back the clock and go back to glasses. LASIK surgeons often have very few options to fix LASIK complications. Therefore, if you become one of the LASIK complication statistics, you will find yourself in a place you wish you never knew existed. Miriam Karmel. Addressing the Pain of Corneal Neuropathy. EyeNet, Jul/Aug 2010. The cornea is the most powerful pain generator in the human body, said Dr. Rosenthal. The density of corneal pain receptors has been estimated to be 40 times that of dental pulp. He explained that the damaged nerve fibers in the cornea, the sensory fibers, cause all the symptoms, whether or not the initial disease is severe dry eye or corneal neuropathy. "Jayne S. Weiss, MD, professor of ophthalmology and pathology at Kresge Eye Institute in Detroit, recalls such a case. A young man presented to her with excruciating corneal pain and evidence of a healed lamellar keratotomy. “Confocal microscopy revealed abnormal collections of unusually tortuous corneal nerves consistent with corneal neuropathy. Although vision eventually recovered to 20/20, the patient had asked at one point if he could have retrobulbar alcohol injected to dull the pain,” she said." Nerve damage is evidenced morphologically by an altered appearance of stromal and subepithelial nerve trunks seen with confocal microscopy in operated human corneas and by a reduction in their number, which persists months after surgery. Experimental studies in animals have additionally shown that after injury of the peripheral branches, some of the corneal trigeminal ganglion neurons die, whereas the rest initiate, with variable success, the regeneration of their peripheral, cut stumps and form nerve-end neuromas in the borders of the wound. Also, peripheral axons of uninjured neurons innervating neighboring territories sprout and invade temporarily the denervated areas with new axonal branches. Furthermore, injured nerves exhibit altered functional properties. In intact afferent fibers, impulse generation occurs exclusively at the sensory endings. Nerve fibers cut during surgery lose their distal end, ie, the transduction area where specific stimuli are converted into a discharge of propagated nerve impulses. Consequently, responsiveness to natural stimuli is impaired. It is well established that axotomized sensory neurons also change the expression of ion channels involved in the transduction and generation of nerve impulses. This leads to abnormal intrinsic electrical excitability at injured nerve stumps, which causes appearance of spontaneous impulses (ectopic activity) and abnormal responsiveness to minimal stimuli at damaged sensory fibers, producing dysesthesias and neuropathic pain of peripheral origin. This neuropathic pain develops spontaneously or is evoked by stimuli that under normal conditions would not elicit such a response, applied on or near the cut end of an injured sensory nerve, giving rise to abnormal sensations including the "phantom limb" sensations reported by patients with amputated extremities. "Dr. Tervo theorized that all dry-eye symptoms patients experience more than a year after refractive surgery may not actually be dry eye; instead, they are caused by aberrantly regenerated nerve fibers in the cornea." Degeneration of nerve structures, characterized by thinning or even complete absence of subbasal nerve fibers, is visible in the flap area just a few hours after LASIK. The subbasal nerve plexus was not detectable 1 week after LASIK, although the first very thin nerve fibers were visualized 1 month after the procedure. Although the subbasal nerve plexus incorporating parallel and branched fibers began to be visualized 1 year postoperatively, complete physiological reinnervation was not seen up to 2 years after LASIK. The whorl-shaped [normal] configuration of the subbasal nerve plexus was not detected in any patient. In most cases, the subbasal nerve fibers recovered to a near-normal state but abnormal curved or thin and non-branching subbasal nerves were found in all corneas. Disclaimer: The information contained on this web site is presented for the purpose of warning people about LASIK complications prior to surgery. LASIK patients experiencing problems should seek the advice of a physician.